The Dow Jones stock average closed early September Friday at 17,137, despite the fact that the payroll jobs report was a measly 125,000 new jobs for August, an insufficient amount to keep up with the growth in the working age population. The BLS establishment survey doesn't get much press love or headline buzz when it comes to the monthly employment statistics, despite the survey's better accuracy than the population survey. For the past year, 1.899 million payroll jobs have been added and payrolls now stand at 132,821,000. From a year ago this is a 1.5% increase. 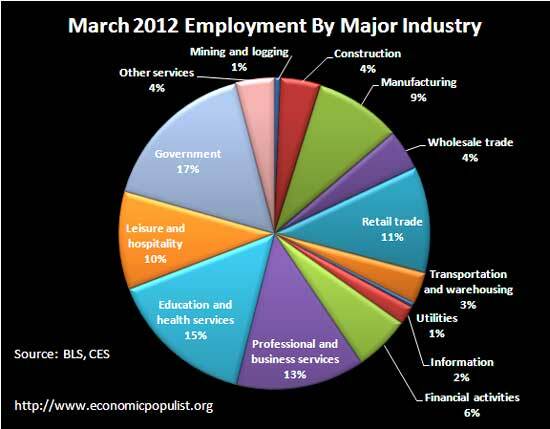 The below pie chart breaks down March 2012 payrolls by major industry's percentage of total employment. The January unemployment report created quite a stir. Many believed the BLS had simply dropped 1,252,000 people out of the labor force, discarded like trash. Is the BLS an evil doer as so many declare, or could the culprit possibly be the 2010 Census? We already showed how comparisons between December and January cannot be done due to the incorporation of the 2010 Census data and the yearly population controls, benchmarks and seasonal adjustments incorporated into the January unemployment statistics. While there is no mythical 1.252 million dropping out of the labor force, there are some highly unusual numbers in the BLS population controls. The December to January unemployment statistics are often reported wrong in the press. We're sorry, god love ya, but these articles are plain incorrect. People like to compare the month to month change in population, the number of people no longer considered part of the labor force and other data. The headline number from the Unemployment Report this morning showed 243,000 jobs were created, more than the highest estimated increase by any of the economists surveyed before the report was released (the average expected increase from the economist survey was 120,000 jobs). The unemployment rate fell to 8.3%, again lower than predicted, and certainly good news for President Obama. Job growth was nearly across the board – in retail, construction, manufacturing, business services, and the hotel and restaurant industry. You can believe all this if you want, or you can go into the details in the report for some interesting context. First, ever since the credit crisis of 2008, there has been a trend in the unemployment report that shows a declining participation rate in the job market. While a whopping number of jobs were created in January, a far larger number of people left the labor force - 1,752,000 in fact. The percent of the total working population who did not have jobs rose to 36.7%, an all time high. It’s no wonder the unemployment rate fell, when the denominator shrinks so markedly. The total number of people employed fell by 737,000. So what do you want to celebrate – the 243,000 who got jobs, or the million or so people who dropped by the wayside and are no longer counted in the data?